We left the Florida Keys for the Bahamas on Monday morning. It was still dark and the smell of fresh espresso permeated our galley. The sea was calm. The skies looked perfect. We couldn’t have asked for better weather. Just before dark – eleven hours later – we were anchored at Cat Cay, Bahamas. And, I want to tell you that it was fantastic. And, some parts of our trip were great. But, sometimes the hours felt like they would never end. Unfortunately, I am prone to seasickness and spent most of my time in bed. But, enough about this. Really, boo hoo. Rick communicated by VHF radio with some tanker ships. He wanted to get a sense of the range of our newly installed AIS. He also called his dad by Sat phone to say hello. Even though you feel as though you are in the middle of nowhere there is no shortage of traffic, particularly huge tanker ships. We saw a tug boat pulling a freighter ship. The distance between them was great enough that we could have sailed between them if we weren’t paying attention. 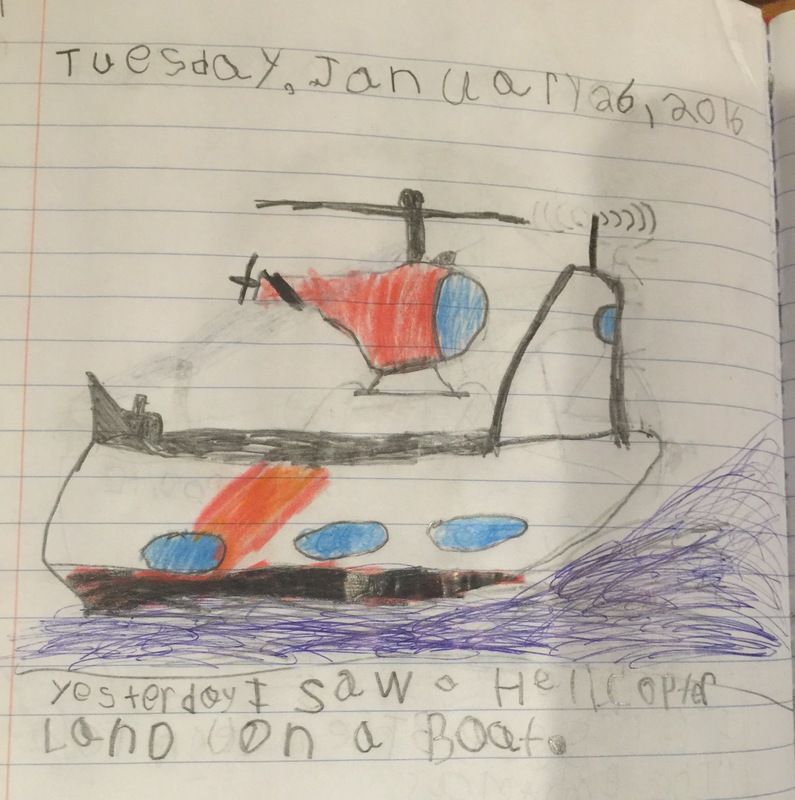 The kids saw flying fish, and Paul saw a helicopter land on the back of a coastguard ship. They were doing some training maneuvers. In fact, they called us on VHF radio to ask us to change our course to go around them. Here is a picture that Paul drew for his journal today. The Gulf Stream is amazing. It moves like a living organism. There are rolling waves, and waves within those waves. It’s sort of like looking the skin of an elderly person. Wrinkly, and very much alive. My seasickness was cured when we saw land in front of us. At about hour nine we could see the Bahamas. Rick hoisted our yellow quarantine flag. Rick hoisting our quarantine flag, which is needed before you clear customs. Our next challenge was arriving at the Cat Cay Marina and clearing customs. Learning to steer a boat up to a dock requires practice. It’s a bit like parallel parking – things can go very well but you might also end up scraping paint off your bumper. So we drew pictures, and came up with a plan. I put out fenders. We positioned our dock lines. Everything was in place. It wasn’t as though nothing could go wrong. Rick did some great steering. But, I kept missing a pile, dropped our boat hook, and considered swimming to the dock on two occasions. Once to retrieve the boat hook, and then to get our line on a pile. Eventually, a man from the marina came to help. I ended up using our scuba gear to retrieve the boat hook, disturbing a ray in the process. Our kids were very excited. At the marina they saw starfish, pink conch shells, a squid, some fish, and a huge ray. The ray was big enough to fill a tractor tire or manhole cover. Fortunately, my ray was mere inches across. Tonight we are anchored outside of Cat Cay Marina near their airstrip. Cat Cay is a private island, and home to about a hundred wealthy people, including Jimmy Buffett. Loving the photos already- Paul did a great job on the helicopter picture!!! the photos are fantastic. your description of the gulf stream is poetic. sorry to hear you were sick, ugh nothing worse. glad you all arrived safely. Thank you for sharing your warm weather. We’re still cleaning up from a blizzard so it’s nice to read about folks who are out enjoying the sun. Hi! Glad you made it. Love your stories (and pics). Keep them coming. Ewa picked up a French boat called Banane Ma. She is headed to Georegetown and beyond. We really enjoyed having her stay with us.